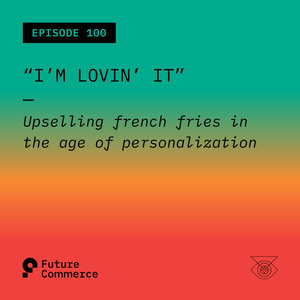 A retail podcast focused on what's new and what's next in commerce - cutting-edge, next generation technology and strategy for modern brands. We unpack the daily news of retail brands around the world and break it down into actionable insights for your business. In this episode, we unpack Instagram and Pinterest: is social commerce the new "dot-com"? Can a fast food chain be a good steward of an AI-based startup? Plus: Glossier and Rent the Runway go Unicorn, Apple Credit, and Jeremy King leaves Walmart. It's our 100th episode, cue the confetti and champagne! McDonald's acquires personalization company Dynamic Yield, and it's an interesting choice to say the least. Levi's going public? Crapple? How much more can we talk about this? Apple Credit is on its way in, will it be less terrible than everyone thinks it will be? Two female-focused (and founded) amazing brands hit unicorn status, which is super awesome. Is Mcdonalds Secretly a Tech Company That Serves Burgers? There's so many McDonalds jokes to be made it's not even funny, most of them about obesity and high blood pressure. The news of the week is McDonald's acquiring professional service/personalization company, Venture Yield, which has some people scratching their heads in confusion. Brian says McDonald's is a technology company that serves hamburgers, Phillip does not react well to this. Hot take: It is cheaper for McDonald's to acquire Dynamic Yield for 300M and let it enable all of its programs on the personalization front, and still allow the company to operate as a personalization engine to the masses writ large in e-commerce. Essentially it is cheaper for them to acquire Dynamic Yield then it would be to contract with them in the next three to five years. And maybe this acquisition is a talent play so McDonald's can use Dynamic Yield's personalization capabilities to be able to make a play in the future economy. However, can McDonald's, being well McDonald's actually be good stewards of this brand when they can't even be good stewards of their milkshake machine? Brian makes the point that Dynamic Yield may actually help McDonald's make their customer experience better. Is Dot-Com Going The Way of The Dodo? Jeremy King is leaving Walmart, and heading to Pinterest. Phillip says Instagram commerce is Commerce 3.0. Pinterest is back in the commerce game, just in time for their impending IPO, and it's basically 2016. Phillip says commerce on Instagram and Pinterest will eliminate the need for websites, especially with the discovery elements on these platforms, and it's Amazon's worst nightmare. What about Shopify? Shopify could be a pretty big threat to Amazon as well, and it's the cereal of choice for private equity, and VC backed D2C brands. Brian makes the point that dot-com will still be necessary in the future for certain types of purchases and will be part of a brand's strategy for future growth. Phillip compares dot-com to fax machines, which is pretty great, and says that brands will not need to heavily invest in dot-com because websites are not aiding in discovery. Jeremy is King moving over to Pinterest signals that they are looking to level up their tech game, through technology platform and developer adoption. Could Pinterest see a similar technological revolution to Walmart? Warning: retailers really shouldn't miss the bus on Instagram like they did on Amazon, it will be a huge mistake, huge. Phillip tries to buy sneakers, which is shocking but there's a story: somehow purchasing through the Nike app is not as seamless as it seems, and Phillip almost ended up with four pairs of the same sneakers. So why should we care about Apple credit? Brian questions whether Phillip wants to talk about this at all. Commerce impact: To get the rewards at the reward rate you have to use Apple Pay as opposed to the titanium card, which will make Apple loyalist demand that retailers accept Apple Pay anywhere. Brian throws shade at Apple loyalists. Apple is basically just a money machine at this point, but at least Apple Credit seems better than the Apple home speaker. Brian and Phillip are not qualified to talk about finance or banking or budgeting systems. Levi's goes public, just as it rolls out customizable jeans and avenues to customer-influenced personalization. UPS is partnering with a blockchain company with the best name ever, Inextion Zippy to build a block-chain capable B2B e-commerce platform. Brian thinks this is going basically nowhere, which is probably true. In unicorn news: two major female-founded brands have hit the 1B valuation mark, Rent the Runway and Glossier. This achievement is a huge accomplishment for all involved but hats off especially to CEO of Rent the Runway, Jennifer Hyman, and Glossier founder Emily Weiss. Phillip and Brian have a hard time logging off the show, and it's pretty funny. Go over to Futurecommerce.fm and give us your feedback! We love to hear from our listeners! Retail Tech is moving fast, and Future Commerce is moving faster.